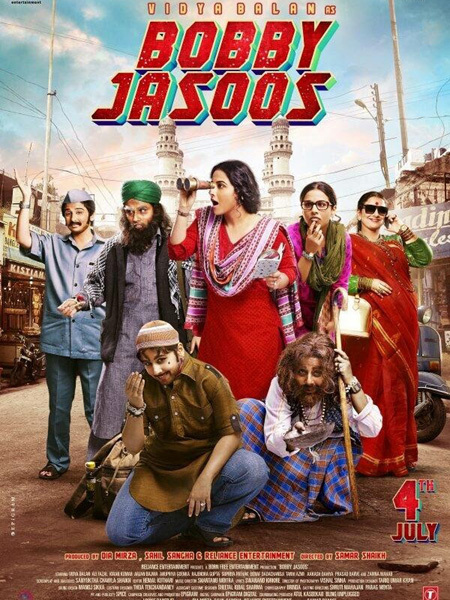 Vidya Balan strikes back as “Bobby Jasoos” wherein she plays an amateurish detective. But does it really create an impact??? In the beginning of the movie you get introduced to the world of Mughalpura in Hyderabad, the place where Bobby Jasoos stays and her struggle to become a famous detective and her immediate family of sisters and Khala’s. Life changes for her when a stranger Anees Khan (Kiran Kumar) gives her an assignment to find out a girl Nilofer in Mughalpura. Who is Anees Shaikh and why does he want to know about the girl….forms the rest of the plot. Written by Samyukta Chawla Shaikh, the story and screenplay emphasizes not only on Bilkis Ahmed’s a.k.a Bobby Jasoos’s professional adventure but also her personal life and somewhere in the story and screenplay that takes pretence and the movie looses completely on the aspect of edge of seat thriller which is expected from a detective movie. There are many characters introduced in the movie but many of them have no relevance to the main plot. The sequence which involves Bobby’s personal life is very well written. After an hour especially post interval is when the screenplay just falls flat and the not so impactful climax does not help either. Debutant director Samar Shaikh tries his best to make the setting as realistic as possible and is successful as well, right from the dialect of all the characters to the settings, but where the movie falters is the absence of thrill which is expected from a movie based on a detective. It is the superlative performances of the ensemble cast which lifts the movie. Vidya Balan as Bilkis Ahmed/ Bobby Jasoos does a good job. Ali Fazal as Tasawur is earnest in his portrayal but somewhere he gets overshadowed by the rest of the cast. Other cast like Arjan Bajwa, Supriya Pathak, Kiran Kumar, Aakash Dahiya, Rajendra Gupta, Benaf Dadachanji and Prasad Barve do a fantastic job rising above the writing. Tanvi Azmi and Zarina Wahab are excellent but are wasted in brief roles. Another highlight of the movie is the Production Design and the Costumes. Production Design by Tariq Umar Khan is spot on and very realistic, the same goes for the costumes by Thei Tekchandaney & Sheetal Sharma which absolutely blends with the narration. The third highlight is the Cinematography by Vishal Sinha which captures Hyderabad especially the locality of Charminar like a dream. Shatanu Moitra’s music is average excluding one song “Arziyaan”..